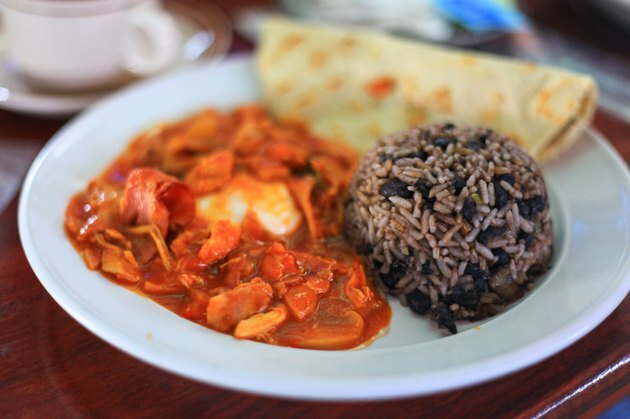 Black beans and brown rice are food staples in many cultures. The reasons are numerous: they're highly nutritious, low-cost, and quick and easy to make. Fresh vegetables, such as onions, carrots and bell peppers, added to beans and rice, contribute additional healthful benefits. Whether you choose Creole flavors of the American South, or incorporate the taste of the Southwest or Mexico into your dish, black beans and brown rice can give your diet a nutritional boost. Black beans and rice served together form a powerful nutritional team. A 1-cup serving of cooked, long-grain brown rice contains 5 grams of protein, 45 carbohydrate grams, 2 grams of fat and 216 calories. The same serving size of cooked black beans without salt has approximately 15 grams of protein, which is 30 percent of the daily value set by the FDA based on a 2,000 calories per day diet, 41 grams of carbohydrate, less than 1 gram of fat and 227 calories. Although your body requires small amounts of vitamins and minerals, they play an essential role in hundreds of functions, such as building bones, healing wounds, converting food into energy and repairing cell damage. A 1-cup serving of cooked brown rice contains 84 milligrams of magnesium, which is 21 percent of the DV set by the FDA and 162 milligrams of phosphorus, which is 16 percent of the DV. The same amount of cooked black beans provides 611 milligrams of potassium, which is 17 percent of the DV and 256 micrograms of folate, which is 64 percent of the DV set by the FDA. Dietary fiber is a form of complex carbohydrate found in plant foods. Although humans aren't able to digest this substance, it provides important benefits for your body's health. Dietary fiber helps stabilize blood sugar levels, lower blood cholesterol levels, prevent constipation and is linked to protection against some types of cancer. One cup of cooked brown rice contains 3.5 grams of dietary fiber, which is 14 percent of the DV and a 1-cup serving of cooked black beans provides 15 grams of fiber, which is 60 percent of the daily value set by the FDA. Complete proteins, which must be obtained through food, contain all nine essential amino acids -- the building blocks of protein. Foods, such as animal-based products like poultry, dairy, eggs, meat and fish, as well as soy and quinoa -- a grain, are good sources of complete protein. You can, however, combine a food like brown rice that lacks some of the nine essential acids, known as an incomplete protein, with another food like black beans that provides the missing amino acids to make a complete protein. In fact, as long as you eat these "complementary" proteins within 24 hours of each other, your body still uses them as a complete protein. Columbia University: Go Ask Alice! : Complete and Incomplete Proteins in Grains and Vegetables?